Dane Lloyd says his views have changed since 2009. OTTAWA — The federal Conservative candidate vying for Rona Ambrose's former seat once tried to recruit enough members to incorporate a Canadian chapter of the National Rifle Association. 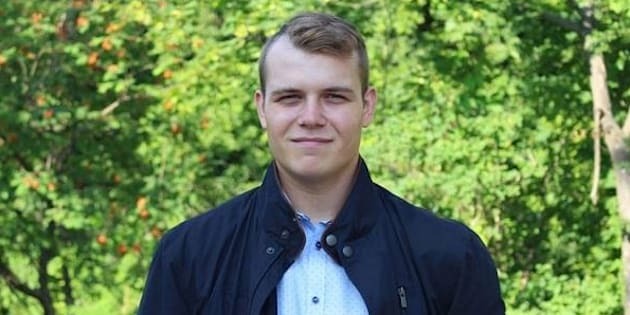 Dane Lloyd, who is a 26-year-old candidate running in the Sturgeon River-Parkland byelection, started a Libertarianism-inspired Facebook group in 2009 with the intention to turn it into a "big movement." "Libertarianism and the right to bear arms are synonymous since the freedoms of Libertarianism are guaranteed by a well armed citizenry," the then-18-year-old wrote. Screengrab of a post from 2009. That statement does not reflect my current view and policy on firearm ownership in Canada. My policy on firearms is a commitment to cost-effective gun control programs designed to keep guns out of the hands of criminals while respecting the rights of law-abiding Canadians to own and use firearms responsibly, and includes measures like safe storage provisions, firearms safety training, and mandatory minimums for criminal use of firearms. Lloyd, who self-describes his political views as "very Conservative," beat out former party leadership contender Rick Peterson, local party organizer Jamie Mozeson, and ex-political staffer Luke Inberg for the Tory nomination. Ambrose, the party's former interim leader, had endorsed Mozeson. In 2015, two years after Lloyd graduated from Trinity Western University, he shared his thoughts on a Russia Today story suggesting that he no qualms about memorializing the legacy of the U.S. Confederacy, as old social media posts suggest. The story reported on Baltimore officials mulling a plan to remove Confederate general Robert E. Lee's name from a city park. "This would be a real shame to see go through," the post on an account associated with Lloyd's name reads. He said the former Confederate general's "actions at the end of the war did much to heal and unite a deeply divided nation." Baltimore eventually introduced legislation to rename the city park to Lake Roland. The timing of the post preceded renewed public pressure to rename monuments linked to U.S. Confederate figures after a white nationalist rally in Charlottesville, Va. this summer. In another post, this time from 2014, Lloyd shared a link to a fundraising campaign by The Rebel to fight "anti-Christian bigots on Nanaimo city council." "It just goes to show that when people actually stand up to intolerant anti-Christian rhetoric, common sense and justice will prevail," reads the post. The Vancouver Island municipality stirred some controversy at the time for pulling a permit for the Leadership telecast, a so-called Christian conference, days before the event. One city councillor had an issue with the event sponsor's link to anti-gay views and "support of the traditional family." Reaction to the event's cancellation was mixed: former NDP MP Jean Crowder and the Vancouver Island Rainbow Association praised council's decision, while right-wing pundit Ezra Levant blasted it, and one letter to the editor called it "over-the-top panic." Lloyd did not respond to a request for comment for the views he expressed in these two posts. The Conservative candidate made headlines recently for another Facebook comment he made in 2009 in response to the University of Guelph's decision to shutter its women studies program. "I'll probably get assassinated by the Feminazi's for saying that cutting this program is a good thing, saves a lot of wasted money on a useless program," he wrote. "Way to go Guelph way to be politically incorrect." Sturgeon River-Parkland Conservative candidate stands next to a campaign sign. Lloyd explained himself to CTV News last week, saying: "Sometimes you get in to emotionally charged debates and you say things that you regret and I would say that would not be a term I would use today." He told the broadcaster he didn't think an old social media post would affect his campaign. Despite Lloyd being a new public figure, he has earned some political experience working under former cabinet ministers Ed Fast and Jason Kenney. He is also a Canadian Armed Forces reservist and most recently worked as a political staffer for St. Albert—Edmonton MP Michael Cooper. Justin Trudeau Says 'Canada Isn't Immune' After White Supremacist Rally In U.S.
Blog: Are O'Leary And Leitch The Soul Of The Conservative Party? Conservative Leader Andrew Scheer joined Lloyd at an event in Stony Plain, Alta. on Tuesday to kick off his campaign. "He's got big shoes to fill coming in after Rona Ambrose, she was a great member of Parliament," Scheer said. After the crowd applauded his tribute to his predecessor, Scheer joked with supporters. "I said Dane has big shoes to fill, they're not actually big shoes, they're metaphorically big shoes. I think he probably wears a few sizes bigger than Rona did." Sturgeon River-Parkland voters will head to the polls on Oct. 23.